Despite the best laid plans, you will usually be thrown a few curve-balls on Christmas Day so the team here at Field Day have come up with some ways to help ensure hassle free Christmas Entertaining! 2. Prepare your potatoes in advance & freeze. Par boil and fluff up your potatoes a week or so before Christmas, pop them into zip-lock bags with goose fat and freeze them. They can be cooked from frozen on the day and come up just as tasty and crispy as ones prepped on the day. 3. Sprouts can also be prepped beforehand - best done the day before. Simply par boil them for a few minutes and add to a ziplock bag. Fry off pancetta and chestnuts with some garlic in olive oil. Add to the ziplock bag. Use a frying pan/wok to heat them up on Christmas day - they'll only take a few minutes! 4. An easier way to serve carrots and parsnips on Christmas day is to make a Carrot & Parsnip Pie. Boil and then mash your Carrots and Parsnips together. Layer them into a lasagne dish with a sprinkle of grated cheddar and lots of black pepper between each layer. Finish with cheddar on top. This can be prepped the day before, stored in the fridge and popped in the oven to heat for about 20 minutes, until the cheese starts to brown. The bonus with this one is that it stays warm for ages on the table. 5. Don't stress about buying pre-prepared. Life's too short to wrap a sausage in streaky bacon. 6. Heat your Christmas Pudding in the microwave. This is a controversial one but if you are stuck for space on your hob or if you forget to put the pudding on in time (has happened! ), you can portion it onto plates and heat in the microwave before serving. 7. Make your gravy beforehand. Jamie Oliver’s recipe seems to be the most popular, using chicken legs or turkey drumsticks (easily bought in the supermarket at this time of year). It keeps for a couple of days or can be frozen for longer. 9. Equally with mincemeat, buy a decent jar, add a glug of brandy and hey presto - it’s home-made! Fresh ready-to-roll shortcrust pastry works a treat too. 10. 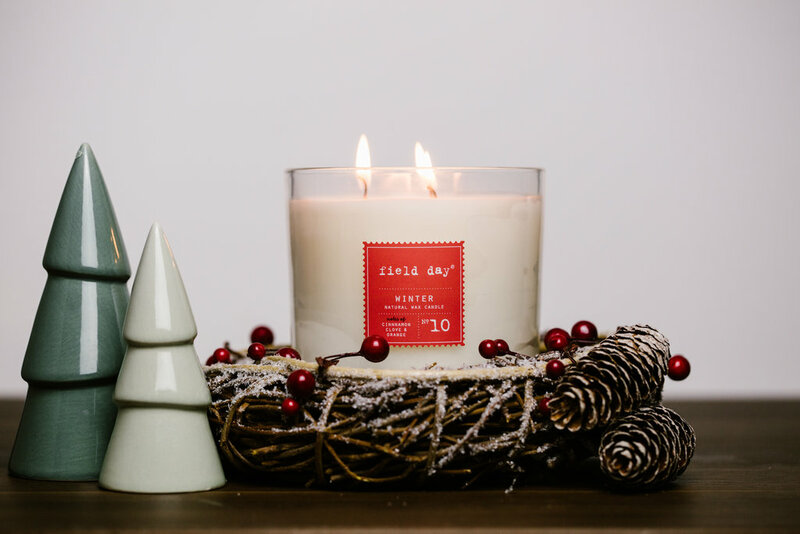 Make your home smell AMAZING with an Extra Large 3-Wick Field Day Winter candle. With over 100 hours burn, it's perfect for burning on Christmas Day and beyond. Limited stock left! But most of all, try to relax and enjoy the day. Anyone you have in your home on Christmas Day is beyond delighted to not be cooking themselves. Having said that, make sure you get them to do the dishes afterwards while you put your feet up! Have a very Happy Christmas from all of us at Field Day and we will be back on the blog again in January!